What do you do as an architect when it is as if your profession has been abolished and you would like to know whether what you have built is actually any good? 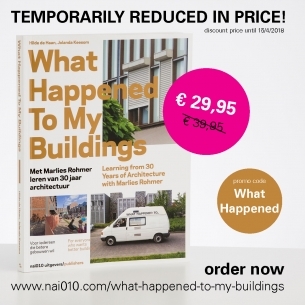 Marlies Rohmer bought a van, pasted bigletters saying ‘What Happened To?’ on it and revisited 25 buildings of which she once had great expectations. She talked with commissioners, residents and users. This resulted in a sometimes moving, often hilarious and always informative exploration of what really counts in architecture.